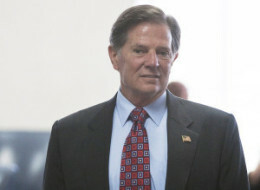 A judge ordered former U.S. House Majority Leader Tom DeLay to serve three years in prison Monday for his role in a scheme to illegally funnel corporate money to Texas candidates in 2002. The former Houston-area congressman had faced up to life in prison. His attorneys asked for probation. Senior Judge Pat Priest issued his ruling after a brief sentencing hearing on Monday in which former U.S. House Speaker Dennis Hastert testified on DeLay's behalf. But not long after Cloeren began testifying, Senior Judge Pat Priest declined to hear the testimony, saying prosecutors couldn't prove the businessman's claims beyond a reasonable doubt. "You lose. I will not hear this testimony," Priest said after agreeing with DeLay's attorneys, who objected to the testimony, saying the former lawmaker was not criminally charged in the case. Cloeren pleaded guilty to directing illegal corporate money into the 1996 congressional campaign of an East Texas candidate. DeLay's attorneys had indicated they would have up to nine witnesses but decided to present only Hastert. Hastert, an Illinois Republican who was House speaker from 1999 to 2006, testified that DeLay was not motivated by power but for a need to help others. Hastert talked about DeLay's conservative and religious values, his efforts to provide tax relief for his constituents in Texas, his work helping foster children and the help he provided to the family of one of the police officers who was killed in a 1998 shooting at the U.S. Capitol in Washington. Lead prosecutor Gary Cobb asked Hastert if one of DeLay's religious and conservative values was taking acceptance for doing wrong. Hastert said he hasn't personally heard DeLay take responsibility for the actions that resulted in his conviction. DeLay's lawyers have also submitted more than 30 character and support letters from friends and political leaders, including Israeli Prime Minister Benjamin Netanyahu and eight current U.S. congressmen. Most of the letters ask for leniency in the sentencing. DeLay was once one of the most powerful men in U.S. politics, holding the No. 2 job in the House of Representatives. After a month-long trial in November, a jury determined that he conspired with two associates to use his Texas-based political action committee to send $190,000 in corporate money to an arm of the Washington-based Republican National Committee. The RNC then sent the same amount to seven Texas House candidates. Under Texas law, corporate money can't go directly to political campaigns. Prosecutors claim the money helped Republicans take control of the Texas House. That enabled the Republican majority to push through a Delay-engineered congressional redistricting plan that sent more Texas Republicans to Congress in 2004, strengthening DeLay's political power.